This article we look into the Top 5 Hydroponic Air Pumps one can quickly get online and at an affordable price. Hydroponics refers to growing plants in an environment in which soil is not present. The word itself comes from two Greek words, hydro denoting water, and ponics denoting labor. Hydroponics has become popular because it provides nutrients and light to the plants in the right quantity and at the right time. It also maintains the proper temperature for the growth of plants. Why do we need air pumps for hydroponics plants? When plants grow hydroponically, everything they need has to be provided by the gardener. And what do plants need to survive? Water, nutrients, light, and air. When it comes to air, plants require dissolved oxygen (DO), particularly for the roots. If a plant doesn’t get enough DO, the roots rot, and consequently, the entire plant dies off. To maximize the level of oxygen to plants in a hydroponics growing system, a Hydroponic Air Pump is needed. When used with a high-quality air stone, the Air Pump can effectively increase the amount of Do. Hydroponics Air Pumps generally consists of an air compressor which is attached to a delivery hose, and at the end of the delivery hose, an air stone is connected. In a hydroponics system, you will need an air pump for hydroponics to push a minimum of 500 to 600cc of air per minute to your nutrient reservoir. This is enough for people doing indoor gardening. For people growing plants commercially, a more powerful configuration is needed. The amount of noise the air pump makes is also something to consider. You, like most people, wouldn’t want a noisy pump. The following is a review of the top 5 hydroponics air pumps, let us know in the comments your best pick and choice. Air pumps are an integral part of your hydroponics system. One of the most popular Hydroponic Air Pumps is developed by CNZ company. It has six outlets and can be used in fish farms, aquariums and of course, hydroponics. 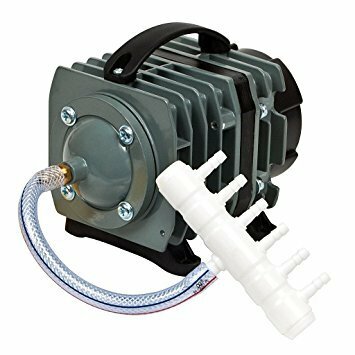 This commercial air pump for hydroponics can easily support 4 to 22 outlets and provides a powerful and reliable performance. The piston and cylinder of the pump are quite durable, and this makes the pump perfect for outdoor usage. The best thing about this Pump is that you can even use it without oil. Another significant benefit is that it’s not very noisy and thus convenient for 24/7 use. With it, you can run multiple air stones at the same time. 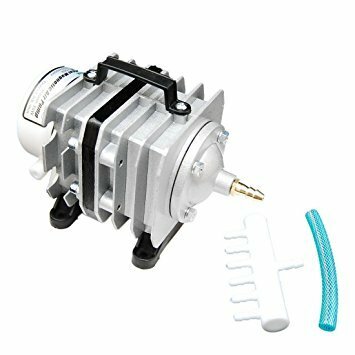 What is the pump made of? The pump runs at 35 watts and pushes air at a speed of 40 liters per minute. Customers have complained that the air pump gets heated pretty quickly and stops working after some time. It comes with a warranty period of just six months. This commercial air pump from Hydrofarm is a perfect choice for hydroponics use. It consists of 8 Outlets and can support multiple air stones simultaneously. The cylinder and the piston of the pump are very durable. The Air Pump is very powerful and produces lots of air bubble. The pump pushes air at the speed of 25 liters per minute or roughly 400 gallon per hour and operates at 12 watts. The consumption of power for the Air Pump is very low, so even if you run the pump 24/7 for months, you won’t burn a hole in your pocket due to the huge electricity bill. The pump comprises an artificial rubber to maintain the flow of air at a steady rate. Its pressure can also be freely adjusted. The air pump comes with a multi-level silencer which makes the pump remarkably silent. Hence, you can use it inside your house without any disturbance. The maximum amp of the pump is 0.1, and the maximum decibel is 45. The pump is also lightweight, weighing only 2.6 pounds. You can easily carry it anywhere without any problem. Even with the company claiming that the Hydroponic air pump is super silent, some customers have complained about it being noisy. This pump by EcoPlus has been rated on Amazon as the number one best seller diaphragm pump, and after reading the user reviews, we can say with certainty that it is. The pump can be used in fish farms, aquariums, and hydroponics systems. The pumps and pistons are durable. They are made of high-quality material making them wear resistant. The EcoPlus air pump comprises an air manifold, which for optimum performance contains 4 to 16 outlets. It can also operate without oil and is silent, thus can be used for indoor gardening purposes. It also contains an inbuilt flow regulator to allow adjustability of the movement of air. The Air Pump can be used for heavy-duty conditions and doesn’t break easily. If it gets over-heated, put it in a properly ventilated place to regulate its temperature. The air pump’s performance is powerful. It pushes 793 gallons of air per hour. You can run it for months, 24/7 and you wouldn’t face a single problem with it. It is a multi-purpose pump suitable for hydroponics systems, aquariums as well as fish farms. The performance of the pump is reliable and robust. Customers have complained about it being a little noisy. The company claims that this Hydroponics Air Pump is the only one in the world that is exclusively meant for hydroponics purposes. Well, it comes with four outlets that are ¼ inch each. Its performance is dominant because it pumps a large amount of oxygen. The pumps can be split off two times to be powerful enough to provide air to at least eight water farm units. It can push up to 320 gallons of air per hour or roughly 20 liters per minute and operates at three psi. The pump is very durable and can be used in heavy duty conditions. It comes with two diaphragms, and the noise it emits is pretty much nil. Note that you can buy a rebuild kit from the market. This means that if your pump stops working, you don’t need to buy a new pump altogether. You can rebuild it. The 120-volt and a 60-Hz pump is a customers’ favorite because of its reliable performance, lightweight feature, and durability. The pump comes with a 1-year warranty. It is not noisy at all. A rebuild kit is available in the market. The pump is a little expensive when compared to other competitors in the market. This powerful air pump for hydroponics from Elemental is housed in a durable aluminum alloy. It is comprised of a piston and a cylinder that is wear resistant. It pushes 951 GPH, i.e., gallon per hour which is a reliable output of air. This pump is suitable for aquariums as well as hydroponics systems. The O2 air pump has an adapter with six outlets for dividing air and a connection tubing of ¼ inch ID. A 1-year warranty is available for the pump which you can extend to a 3-year protection plan for only $5.61. The pump is noiseless. It doesn’t make the annoying growling sound most air pumps make. You can reduce the noise further, by placing a towel on the pump. It occupies a little space, it’s lightweight and can be carried outdoors easily. This 35-watt, a 120-volt pump is well-built and creates a powerful surface agitation that replenishes the level of dissolved oxygen. Some people find this air pump a tad bit noisy. But when compared to traditional Hydroponics Air Pumps, it is not as loud. All the above-mentioned air pump for hydroponics are sturdy and long-lasting. However, if we were to pick a favorite, it would have to be the General Hydroponics Dual Diaphragm Air Pump. It has all the qualities required in a Hydroponic Air Pumps. It ensures that airflow is even and powerful. Many companies claim that their pumps are noiseless, but it always turns out to be otherwise. This air pump, however, is not noisy at all and for this reason, it gets an extra brownie point from us.